“What, are we going down to a half-lane?” I gasped. The roads in the Santa Cruz Mountains perform their own sobriety checks, kids, and the penalty for going over the limit is going offroad, and potentially down a pretty steep and long Thelma-and-Louise kind of drop. 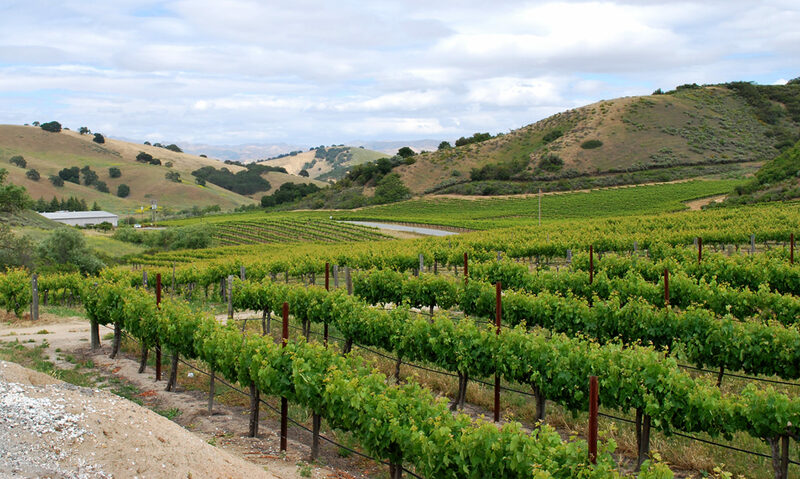 The rewards, however, are the views, and there is no view more stunning than that from Loma Prieta Winery. Or, at least, we assume the view is stunning. It’s pretty high up there, and from the clouds beneath us we could tell there were a couple of big valleys on either side. However, note that bit about the clouds? On a clear day you can see straight to Monterey Bay. This was not one of those days. Regardless, I still wanted to run up to the tasting room spreading my arms and singing, “The hills are alive with the sound of music!” And I don’t even like that movie. 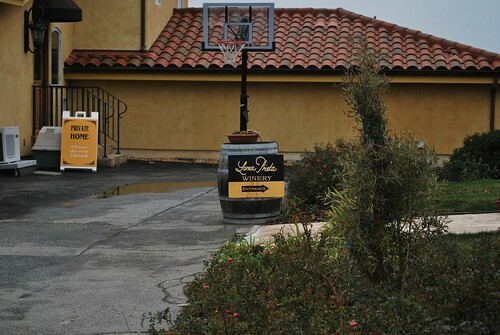 The winemaker’s home is next to the tasting room, requiring prominent signage to keep confused wine lovers from stumbling into the living room. We ran into several friendly people on our way in who recommended that we visit David Bruce Winery and try the pinot. We didn’t get there Sunday, but we swear, it’s on our list! The tasting room staff is backed up by one friendly and non-threatening dog. I am frankly terrified of most dogs both large and small, and even I would have been happy to pet this one. That is, if I weren’t so allergic that it would have rendered me incapable of tasting! 2009 Lodi Viognier: This wine tastes like Chanel No. 5 smells. (Thank goodness Chanel No. 5 doesn’t taste like it smells, or I’d have a very expensive perfume habit.) There was a floral element and a hint of vanilla. In my tasting notes I wrote, “Flowers and butterflies.” What can I say? This swept me away. 2008 Pinot Noir: The fruit for this Santa Cruz Mountain wine was grown in Aptos. The smell was a mix of cherries, chocolate, pepper and wood, while on the palate it was a smooth balance of cherries and alcohol. 2007 Cabernet Sauvignon: This Gilroy-grown wine starts with a little bit of berries, but has a fascinating cinnamon finish, so much so that I kept sipping to make sure it was really there. The tasting room manager brought out some chocolate, encouraging us to sample it and see how it changed the flavor of the wine. The chocolate made the berries deeper and the finish sharper. 2008 Amorosa Vineyard Lodi Pinotage: Pinotage is a grape that is not well-known around these parts, but Loma Prieta has committed to giving it a place at the table, so to speak. The smell is silky with notes of chocolate, gasoline, and wet asphalt. The taste is chocolatey, like having your tongue wrapped in a warm blanket. Someone else described it as “like a really aged zin.” The finish is unusual and very hard to describe. It’s angular, like having the pointy tip of a triangle land on your tongue. Reading it in my notes makes me remember exactly what that tasted like, but dang if I can express it any more skillfully. Port: Mike described this as having a “chocolate covered caramel scent.” To me, it smelled like toffee, chocolate and blackberries. From what the tasting room manager said, it’s excellent as a glaze for duck (something a vegetarian like me is unlikely to make use of, but things change!) Mike thought it tasted like a chocolate covered cherry, while I felt it was more like candy and chocolate mixed together. 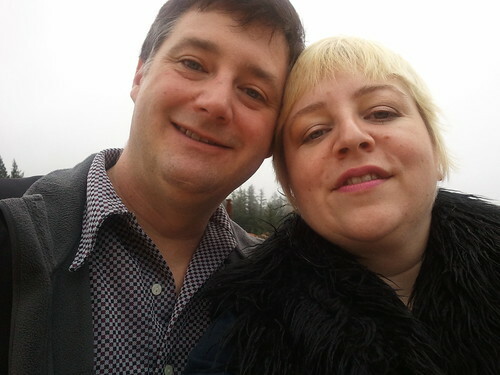 Mike and Nikki in front of the Loma Prieta Winery. The sound of the shutter once again made Nikki blink!